The internal combustion engine (ICE) may be old tech, finding its roots over a hundred years ago, but it’s certainly not dead. Toyota’s new lineup of engines promise to deliver better fuel efficiency than ever before. Given rising fuel prices and stricter emissions regulations, it should come as no surprise that automakers are working on improving fuel efficiency. Have automakers tried everything yet? Apparently not, as Toyota’s new lineup of engines seems to break the mold of current engine design. The problem with fuel efficiency in conventional automobiles is that the ICE is woefully inefficient, averaging less than 30% thermal efficiency. In other words, less than 30% of the available energy in a given fuel comes out of the engine in a usable form, specifically motion. Most of the rest of the energy in the fuel is wasted as heat, basically burning fuel for no reason. By applying a number of proven technologies, Toyota has raised the bar on fuel efficiency with a new lineup of engines. The first two engines to come out, 1.0 ℓ and 1.3 ℓ four-cylinder engines, use the Atkinson cycle, which is more efficient, but less powerful, than the Otto cycle, used in just about every engine in the world. Combining the more-efficient cycle with variable valve timing on the exhaust and intake and a higher 13.5:1 compression ratio, Toyota can maximize power across the entire speed range, even outside of hybrid applications. To further improve fuel burn, a new tumble-flow design leads to a better air / fuel mixture. 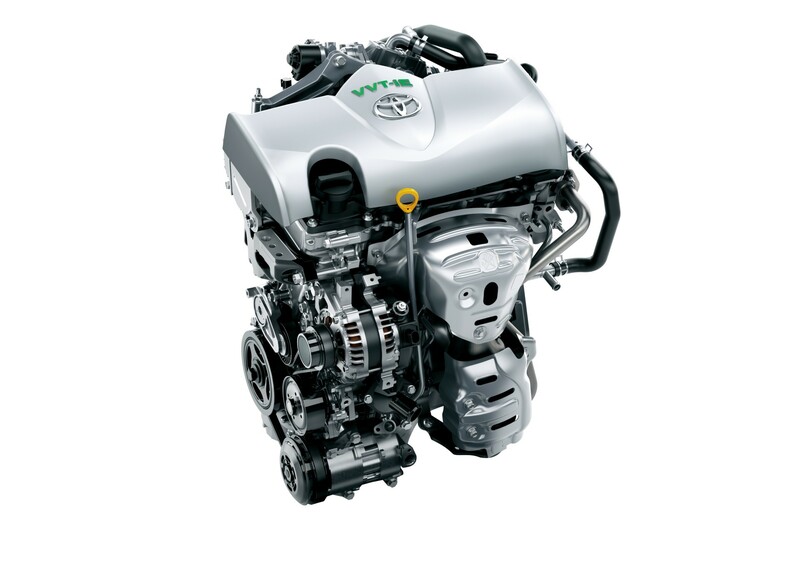 All in all, Toyota’s two new engines are 37% and 38% thermally efficient, a record in mass-production engines. Toyota will roll out the new engine lineup in 2015, fourteen different engines, estimating fuel efficiency improvements of at least 10%.